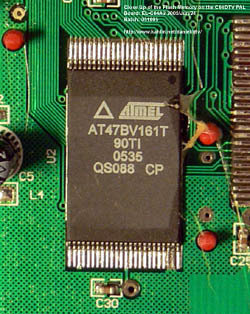 The C64 DTV V2 contains a 2Mbyte Atmel AT47BV161T flash memory which contains all of its software. This flash memory can be selectively erased and written with new data. This information is valid for a DTV V2, batch "051005", flash image "2005 06 07 03:21:11" (stated at the bottom of the directory listing). The CRC as given by the "DTVTEST5" program is 15393EC2. 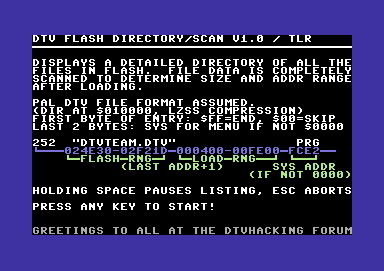 dtv2_kernal.txt - Disassembly including description of file and directory format. 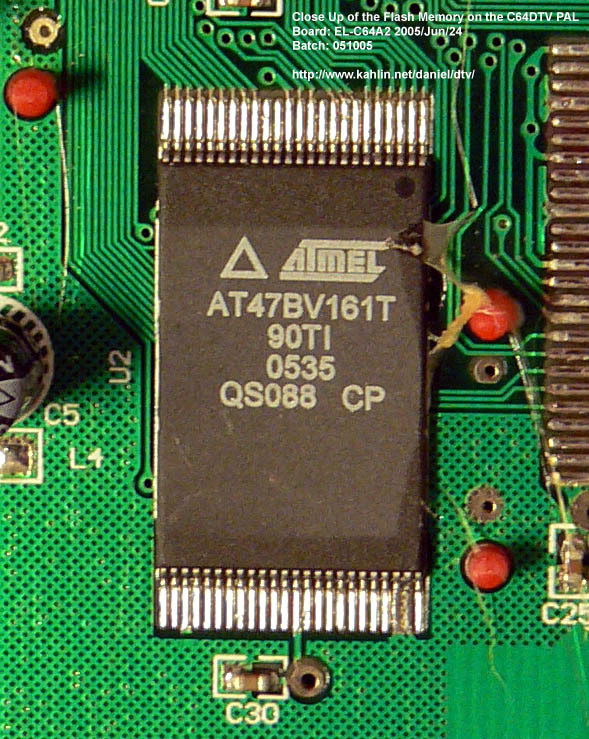 Jim Brain describes the format in this post to the DTV-hacking board (original post). (This information is for the V1, Roland Tögel pointed out that it is different on the V2). 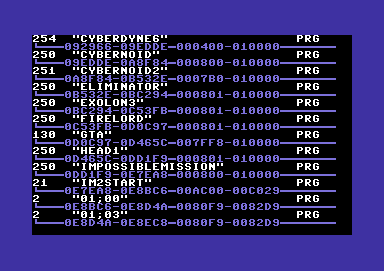 For the V1 it is run length encoded in a way similar to how graphics data is packed in Electronic Arts IFF ILBM format for the Amiga. For the V2 it is a limited form of equal sequences. Fully supports the SST39VF1681 provided you have this simple hardware fix. Nojoopa found a bug with flashing $000000-$010000 on AT49BV163A chips (bottom bootblock). There is only limited sanity checking of the values entered for range. If you enter them wrong, it is often best to do Esc/Pause-Break, and then SYS 2069 to reenter the program. For program range and erase range, simply answering N is sufficient. Note: Erasing/reprogramming sector 00 is a very dangerous operation! You may very easily make the DTV unbootable this way! 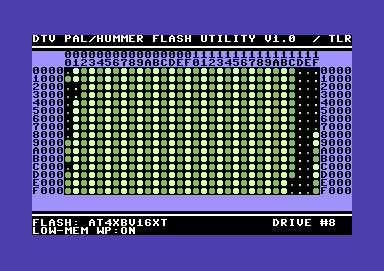 Note: This utility is fully capable of wiping the entire flash at your command, making your C64 DTV permanently unbootable! Make sure you really know what you are doing! I'm very interested in reports of success (or failure). Please include the batch number as printed on the bottom of your unit with reports. If you have the possibility of looking inside, please send the markings of the flash chip aswell. The ram test hook only works with the original DTV V2 (or compatible) kernal in flash. A modified palette is not setup straight after reset. It is setup at the first call to $ff81/$ff5b though, so the impact is minimal. This can be noticed when having no dtvboot installed, going directly to basic using <ctrl>. Pressing Esc/Pause-Break sets up the colors. Display detailed directory of files in flash. Address range used after load for each file is determined by quickly scanning the compressed file. Address range used in flash is determined in the same scan. Displays file sizes in equivalent disk blocks. These pages are being maintained by Daniel Kahlin <daniel kahlin net>.